HomeentertainmentSatanic Temple Sues Netflix For Copyright Issues In "Adventures Of Sabrina"
The Satanic Temple has a bone to pick with Netflix worth $150 million. 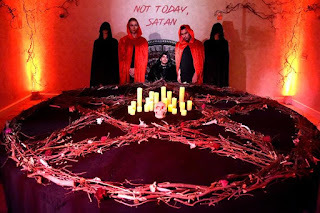 Netflix recently released their latest series, The Chilling Adventures of Sabrina, that plays on the old classic Sabrina The Teenage Witch but with a thrilling twist of dark happenings and Satan references. For that reason, the Satanic Temple has sued the streaming service and Warner Bros. for $150 million, The Blast reports, claiming the show copyrighted their design of the monument to Baphomet. The statue apparently appears in four of the 10 episodes on Netflix. The Temple’s co-founder, Lucien Greaves, even tweeted a photo for reference, as seen below. The Temple is suing for "copyright infringement, trademark violation, and injury to business reputation, asking for $50 million for each one, for a total of $150 million in alleged damages."